HILLSDALE – Immaculate Heart Academy has solidified itself as the No. 2 seed in Bergen County and has been dialed in from the opening day of the season. A 17-1 record is impressive, but head coach Steve Silver still felt his team was only scratching the surface of its potential. With the Bergen County Tournament in full swing and the state tournament on deck in a few weeks, the Blue Eagles might have finally put it all together on Saturday. Led by Emma Matesic and Anna Morris inside, the Blue Eagles were dominant. 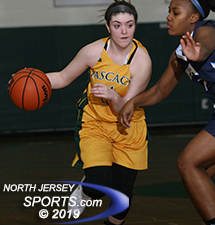 Matesic poured in a career-high 21 points and Morris added 20 as IHA pulled away early in the second half of a 62-32 win over Pascack Valley on Saturday in the Bergen County quarterfinals. Olivia Jones nailed a three-pointer to give the Indians a 3-2 lead. However, that lead did not last long and it would be Pascack Valley’s last. Eliya Herriott and Morris had back-to-back threes to kickstart an 11-0 run that gave IHA a double-digit lead. Pascack Valley played tough and hung in there all the way until halftime down nine, 26-17. As both teams were headed to the locker room neither was prepared for what would come next. Senior Brianne Smith led pascack Valley with 15 points. Condensation from the ceiling created a drip right onto center court, causing a half-hour delay before the second half started. When play finally resumed it was the Blue Eagles who seized control. Herriott had a driving layup to start the half followed by consecutive baskets from Matesic as IHA ripped off a quick 9-0 run and never looked back to earn a berth in the BCT semifinals. Matesic and Morris were dominant for IHA (17-1). Herriott and Brittany Graff added eight and seven points, respectively. Although she was hounded the entire game, Brianne Smith led Pascack Valley (13-5) with 15 points. Jules Vassallo chipped in with eight points and Jones had seven. IHA moves on to next Sunday’s semifinals to face-third-seeded Northern Valley/Old Tappan. Even though the Blue Eagles played a nearly flawless game on both ends of the floor, Silver is seasoned enough to know that this is just one game and a good building block for the remainder of the season.